Harte Elementary School’s custodian, Mingle Kwock, was named Classified Employee of the Year at the recent Ice Cream Social in honor of Classified Employee Week. Kwock began working full-time as custodian at Harte nearly 10 years ago after substituting in the job occasionally and developing a high regard for his co-workers. A man of few words, Kwock succinctly explained why he strives for excellence each day at Harte. Harte Principal Scott Tardibuono had more to say. Several colleagues at Harte nominated Kwock, describing him as hardworking, positive, sweet, meticulous, conscientious, reliable, dependable, trustworthy, pleasant, courteous and respectful. Fifty-nine nominees vied for the award. The nominees and nine finalists were recognized at the Ice Cream Social. The eight other finalists were Dominga Beltran, staff secretary at the Literacy Office; Yvette Brotherton, transportation aide at Newcomb; Jason Church, plant supervisor at Cabrillo; Michael De-Four, plant supervisor at Washington; Sylvia Flegal, office supervisor at MacArthur; Gracie Hind, school data technician at Millikan; David Parker, office supervisor at Stevenson; and Dorothy Price, intermediate accounting assistant at the Professional Development Office. 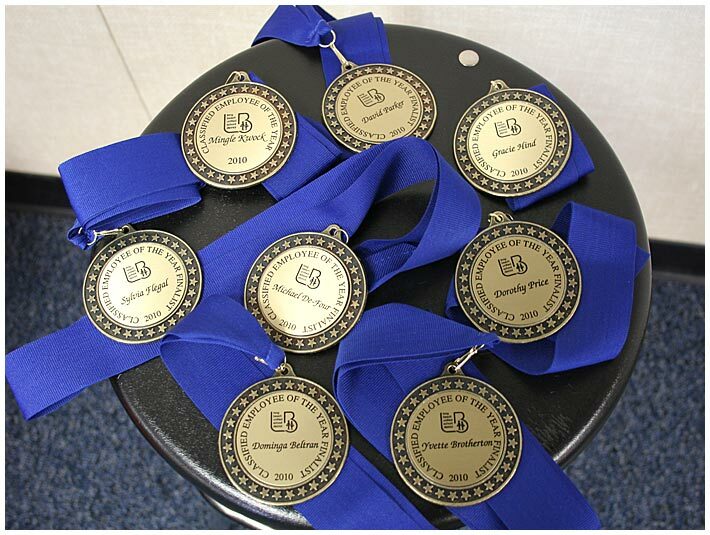 The finalist and top winner will be recognized at the June 1 school board meeting.